The thrilling conclusion to Futurama: Bender's Big Score! Bender and the planet express crew must contend with a massive cosmic team that sends the world into panic. 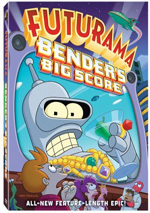 At the end of 2007, Futurama made a nice comeback via the direct-to-video flick Bender’s Big Score. The series continues with 2008’s The Beast With a Billion Backs. In this one, a mysterious and terrifying tear in space appears. When the Planet Express expedition to investigate doesn’t go well, the President sends a military mission to obliterate the universe on the other side of the anomaly. In the meantime, Fry (voiced by Billy West) falls in love with a babe named Colleen (Brittany Murphy). However, it turns out she maintains relationships with four other boyfriends at the same time. Fry tries to accept this but decides he can’t take it. Despondent, he stows away on the warship headed toward the anomaly and decides to take refuge there. While there, Fry encounters a tentacled lifeform that attacks the Earth. The folks there attempt to stop it and discover Fry’s strange involvement with it. A few other plot threads also materialize. Bender (John DiMaggio) follows his idol Calculon (Maurice LaMarche) and becomes a member of the League of Robots. Amy (Lauren Tom) marries Kif (LaMarche) but problems emerge. By the film’s end, all these elements come together in various ways. Though it takes a while for us to get there. For much of the movie’s first half, the tale seems more than a little disjointed. It seems like it throws out different ideas but doesn’t really know where to go with them. Yes, it eventually does manage to tie them together, but it rambles a bit as it heads there. Leela (Katey Sagal) gets the shortest end of the stick. Though one of the series’ lead characters, she has little to do here, and that’s a shame. Granted, I don’t think that every Futurama endeavor should automatically focus on the Fry/Leela/Bender trifecta, and Leela does have more to do as the flick progresses, but she still feels like an afterthought much of the time. As for the main plot, once the tentacle attacks, it displays a definite Invasion of the Body Snatchers vibe. This doesn’t make it a rip-off, and it’s not unusual that Futurama uses inspiration from other sources. The story branches off into many tangents that mean it’s never just a parody of something else. As usual, the Bender segments amuse the most. I rarely get tired of DiMaggio’s take on his character, as he brings hilarity to even lackluster lines. The League of Robots allows us to see plenty of other automatons, and they create the program’s strongest moments. Otherwise… ehhh. Backs comes across as an average Futurama adventure. It’s reasonably entertaining but it doesn’t remotely approach the level of quality found in better episodes of the series. While watchable, it seems lackluster and forgettable. 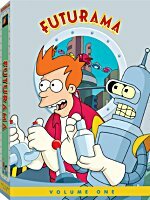 Futurama: The Beast With a Billion Backs appears in an aspect ratio of approximately 1.78:1 on this single-sided, double-layered DVD; the image has been enhanced for 16X9 televisions. I liked the visuals of the first direct-to-DVD flick, and the follow-up looked quite good as well. While not particularly impressive, the Dolby Digital 5.1 soundtrack of Backs was perfectly adequate. The film offered a good sense of environment and used a few action scenes to open up matters in a decent way. Not a lot of these moments occurred, but they worked well when they did, and the general sense of setting satisfied. Backs comes with a pretty decent roster of extras. First we find an audio commentary with creator Matt Groening, director Peter Avanzino, producers Claudia Katz and Lee Supercinski, co-executive producers David X. Cohen and Michael Rowe, and actors Billy West, John DiMaggio, and Maurice LaMarche. All of them sit together for this running, screen-specific chat. They discuss various story and character issues, animation specifics, references, and some acting choices. If you’ve heard commentary for other Futurama endeavors, you’ll know what to expect here. Cohen acts as the super-nerdy master of ceremonies; he brings out a mix of facts and figures related to the film. He proves reasonably effective in this role, but we generally don’t learn a ton about the flick. There’s a lot of joking around, primarily from the actors. Though some of that is fun – I could listen to West’s Nixon impersonation for hours – it eliminates the prospect of much useful material. This is a passable but not particularly valuable commentary. Something intriguing arrives with Futurama: The Lost Adventure. This 30-minute and 11-second piece provides not-so-hot 3D animation intended as the framing story for a 2003 Futurama videogame. The game itself looks like nothing special, but the “show” created to support it works pretty well. It’s not classic Futurama, but it’s quite entertaining. We can watch the program with or without commentary from Groening, Cohen, West, DiMaggio, LaMarche, Rowe, Supercinski and writer J. Stewart Burns. They discuss thoughts about the videogame, some issues related to the 3D animation, problems compiling the footage, the script, and voice acting topics. This commentary informs and entertains pretty well, especially in connection with the acting challenges. Next we find a 21-minute and 44-second Storyboard Animatic. This takes us through the first act of Backs and lets us see the storyboards accompanied by dialogue and some music. It’s a fun way to see the early stages of the film. Six Deleted Scenes last a total of three minutes, 22 seconds. We find “Original Opening (Storyboard)” (0:50), “Fry and Colleen Meeting (Color)” (0:35), “St. Asimov Parade (Storyboard)” (0:21), “Zapp and Scientists (Layout Animatic)” (0:47), “Amy, Fry and Leela (Storyboard)” (0:24) and “Scruffy the Janitor (Layout Animatic)” (0:29). Obviously these are all minor additions, so don'’ expect anything substantial. They're consistently amusing, though, so they’re worth a look. For a look at the film’s guest actor, we get a David Cross Featurette. In this two-minute and two-second clip, we get a few comments from Cross in the studio as he talks about his character. This is a promotional piece without any informational merit, though Cross makes a few funny remarks. Blooperama runs two minutes, 11 seconds. It shows the actors in the studio as they perform the lines, goof up, and joke. I’m not wild about bloopers, but this reel offers some fun glimpses of the recording process, so it’s worth a look. After this comes a four-minute and 10-second segment called 3D Models with Animator Discussion. The piece doesn’t identify the commentators, unfortunately. They look at various scenes and detail the work required to put them together. The info tends to be a bit dry, but some interesting notes emerge. A Brief History of Deathball runs two minutes, one second. We see various designs related to the Deathball sequence as Avanzino narrates. I like the conceptual drawings, and Avanzino’s remarks flesh out the art well. Finally, we find Bender’s Game: A Sneak Peek at the Next Futurama Epic. A preview of the third Futurama direct-to-DVD flick, it lasts two minutes and gives us a trailer for the upcoming effort. 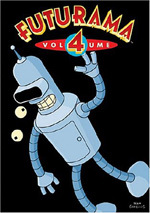 As much as I liked Futurama on TV, I must admit its first two direct-to-DVD adventures haven’t dazzled me. The Beast With a Billion Backs entertains but it fails to become better than average when compared to the series. The DVD provides excellent picture, very good audio and a smattering of useful extras. Backs is good enough to recommend it for Futurama fans, but it’s not a great flick.